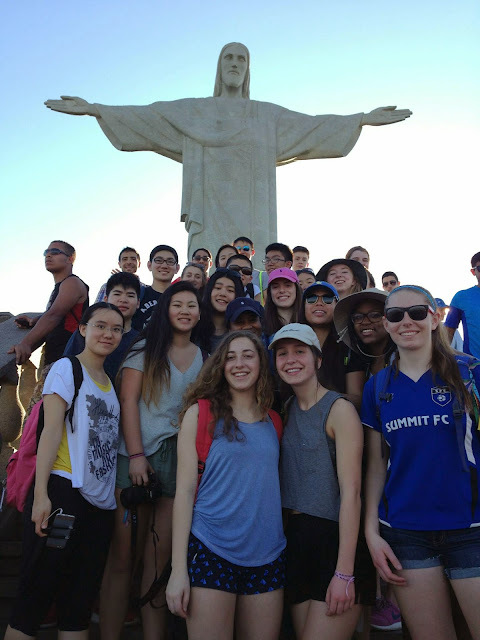 After our overnight flight, we arrived in Rio ready to roll on Thursday morning. Thankfully, our guide Javier was equally excited to get us started. We drove through the late morning rush hour from the airport to our hotel just a few blocks away from the famed Copacabana beach. Javier was fantastic in helping us feel oriented to our new environment. Before lunch, Kevin Kee '17 shared with us his presentation that gave us an overview of the city as well. 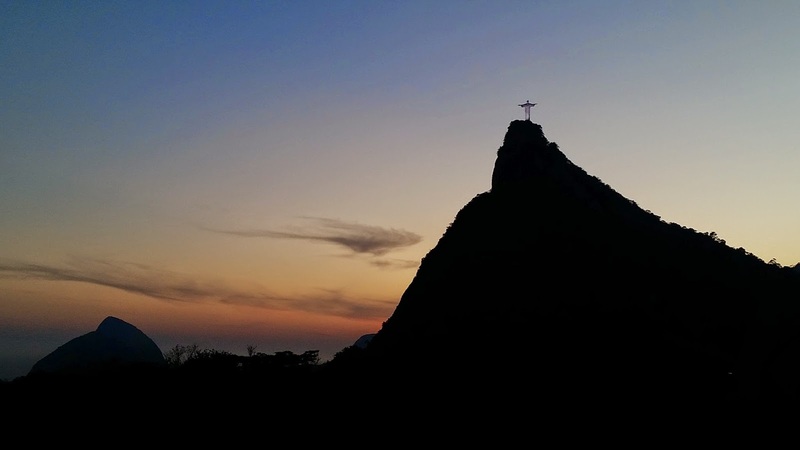 In the afternoon, we made the trek up to Corcovado, the mountain that is home to one of the most famous sights in the world, the statue of Christ the Redeemer. On sight, Abby Mihaly '17 delivered an extremely well-researched presentation on the statue. Thanks to Abby, we all learned about the history and significance of the statue prior to our final ascent to its base. With the sun setting, Javier brought us to one final vista for the evening. It was an incredible way to see the end of our first day in Rio. Yet with the sun down, there was still dinner to come. And Javier made sure we ate well! We went to a Churrascaria for Brazilian barbecue, and the food just did not stop coming! While we were all exhausted by the time we got back to the hotel, we made time for journal writing and a debrief session. Kirstin asked us to consider how our experiences on our first day made us reconsider the idea of progress. For Eve Pomazi '17, the sudden changes across the brief morning car ride offered a new perspective on the varying meaning of progress. "Progress is a term we [have] dissected letter by letter, piece by piece and meaning by meaning in every one of our HUM II classes," Eve wrote tonight. However today meant that "I got the chance to really see Rio, rid of distractions or biases; truly through my own eyes. Individual progress can be selling those bottles of water to the passersby snapping scenic pics, or it can be purchasing the latest and greatest automobile at the car dealer. We saw both on that rolling ban in our first forty-five minutes, and it sure opened my eyes and offered a warm welcome for the next two weeks in Brazil." Gordon Ho '17, like many of his classmates, was left with even more questions as he considered Kirstin's prompt. Gordon wondered if the poorer and undeveloped neighborhoods were "evidence of the past (that is still not developed), or is it in fact, a consequence of this rapid development and transformation" of other areas? He also asked, "What do some people lose when the society is transforming; Who are the victims; What are certain drawbacks when there is progress?" Eve's considerations and Gordon's questions point us toward making the most of an eventful next two weeks in country. Tomorrow we're off to the National History Museum, among a few other stops!